The Fourth of July is next weekend and since my 2-year-old is currently obsessed with the American flag, I thought we'd do a few flag crafts and activities this week to get in the spirit. 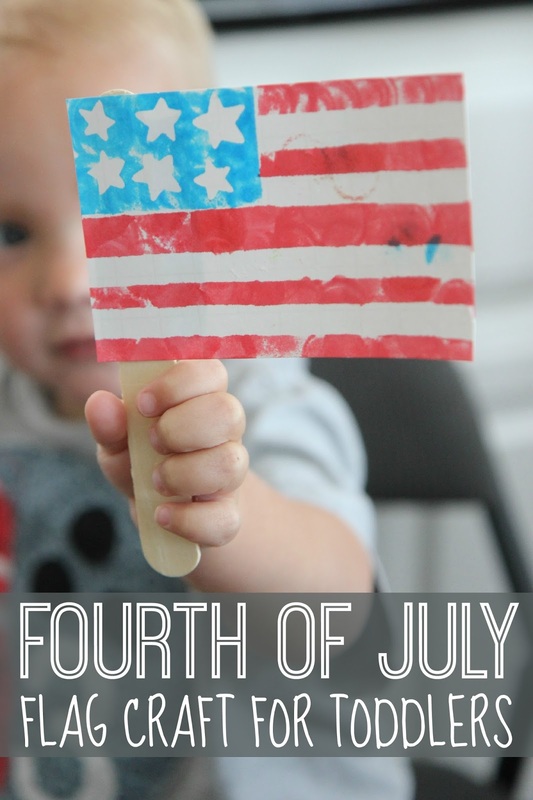 We've shared 10 of our favorite toddler Fourth of July crafts and activities HERE if you need more ideas. We had so much fun making craft stick puppets last week that we thought we'd break out the craft sticks again and use them to make this flag resist craft for toddlers and preschoolers. This craft requires very few materials but is a little bit more directed than some of my usual projects. Obviously you could just let your toddler design his own flag, but since mine was very bent on having an American flag, we tried to make ours like more traditional. To get started you first need to prep a few things for your toddler. If you have older kids, they can do this part themselves. To get started I cut the tape into thin strips and tape them onto the piece of cardstock to block off the blue part of the flag and make stripes. Next we grabbed our dot markers and my son covered all of the white on the paper in red paint. Immediately after he finished I pulled the paper tape off the paint. If it sticks for too long and the paper gets overly moist from the paint then it will rip as it pulls off. Encourage your child to paint, but not soak, the paper with paint. Put an extra paper next to them if they really want to go to town with paint... and then can paint their extra paper. Next I gave him star stickers and told him to put them in the white rectangle. This was a great fine motor activity. We only had bigger stickers so our flag won't look completely official... since we don't have the correct number of stars and stripes. I encouraged my little guy to paint all over the stars and in the white rectangle until it was completely blue! Since the rectangle was so small it was easy to do. Next we pulled off the star stickers immediately. I pulled a few off and my son pulled a few off. We were both pretty excited with how well the sticker resist for the stars worked! Lastly I taped the flag to a craft stick and let it dry. After that there was no putting the flag down! My 2-year-old loves it! He loves wandering around town and hunting for American flags so he is pretty excited to have his very own flag to hold. 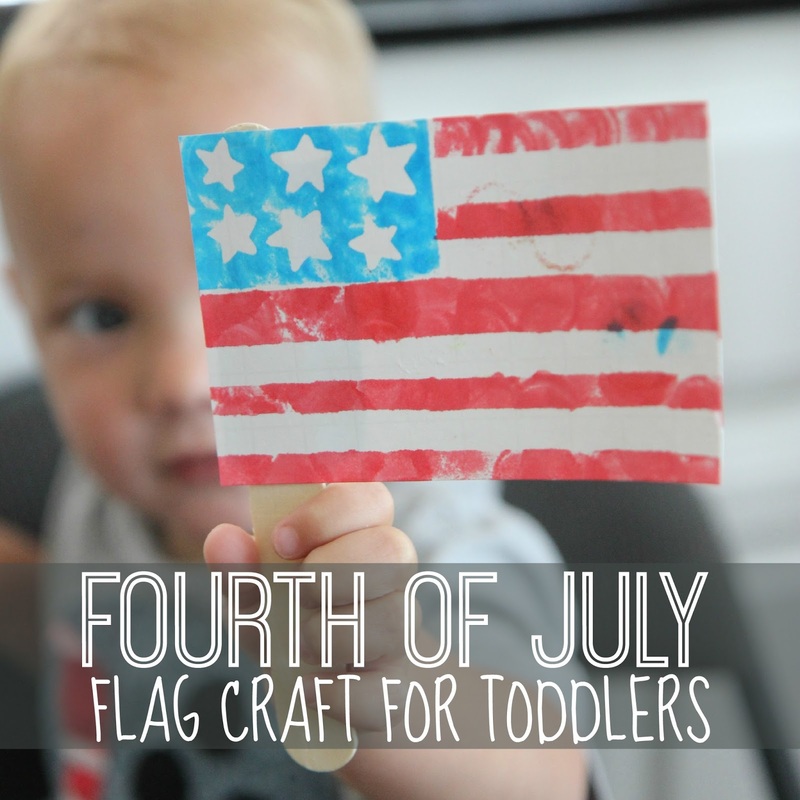 Have you done any flag crafts with your toddler before? Two of my other favorites are this pebble painted flag and this paper plate flag. Both are super easy!